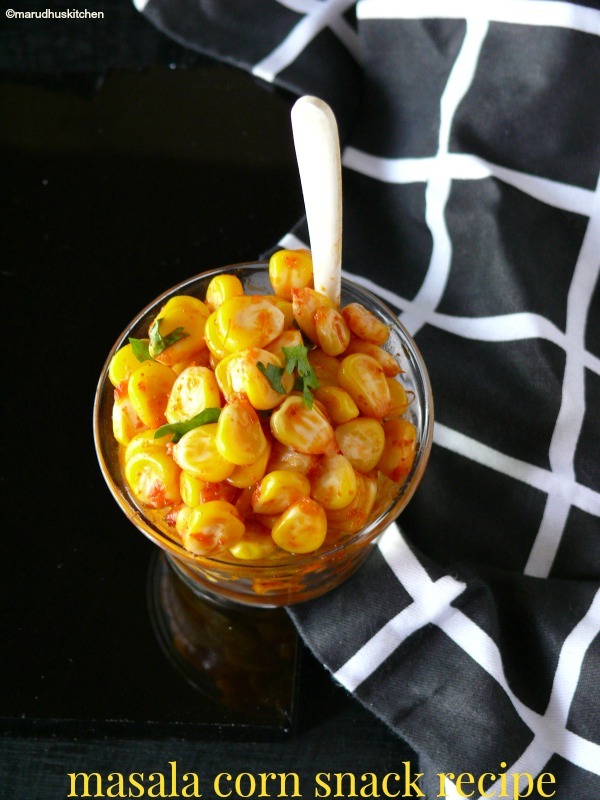 Iam too tempted to post this masala corn snack recipe cause it is very close to my heart kind of comfort food though it may sound simple.Sweetcorn have become a versatile ingredient that can be incorporated in any Indian type of cooking. Kids like corn for its sweet, juicy and beautiful crunchy texture.Every nook and corner of the road here has a small stall selling these masala corn snack recipe piping hot with whole lot of different flavors.My children love to have it as chilly masala corn than chat masala flavored one. I used to buy these corns fresh from the market and will steam,separate the kernels.Put it in airtight containers and store it in freezer.Whenever needed I will simply make this masala corn snack recipe.But, I store it not always for making these masala corn alone. We can make use of it and incorporate in variety of other dishes.Recently have made some corn toast and even soup with this sweet corn.The butter,corn and chilli powder combination is a big hit taste that it has become one of the great after school snacks for our /my kids. 1.Heat up butter in a kadai and immediately add corn kernels and stir in. 2.Add salt and chilli powder. 4.Keep the flame low and close the lid for few seconds(used to sprinkle some water and wait until it dries up). 5.Switch off and add some chopped coriander and serve. Heat up butter in a kadai and immedietly add corn kernels and stir in. Keep the flame low and close the lid for few seconds(used to sprinkle some water and wait until it dries up). Switch off and add some chopped coriander and serve. 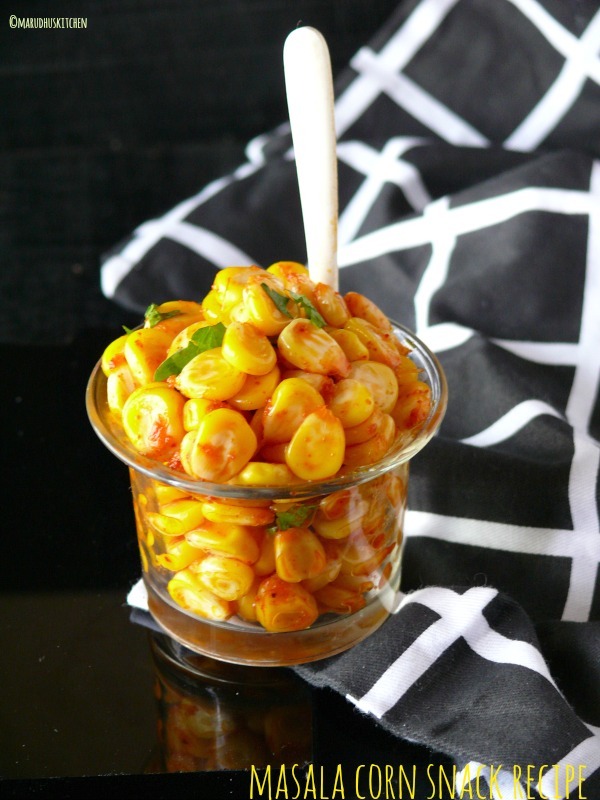 If you like you can add chat masala too to this masala corn. super recipe. I love it too.. Every time I go to T-Nagar my shopping is complete only when I relish the boiled Peanuts sundal and this corn chaat. Amazing. Love that cute little cup.